I have always used a vest but do to back problems I am looking for something else to carry all my gear What are the pros and cons of a sling pack over a chest pack? What about some of those Fishpond pack type packs? I have lightened my vest by only putting in what I really need on the water then keeping the rest on shore in a daypack with lunch, water, etc.. The vest still feels heavy and is hot in this heat so I want to try something else. Been eyeing the Simms Headwater chest sling pack. Good question.. I was thinking about ditching the old school vest myself.. I was watching one of the local fishing shows yesterday and they were advertising a chest pack with magnetic compartments instead of zippers or velcro. Seemed pretty sweet. I can't remember the brand though..sorry. Personal preference. I have a killer hydration back pack with all the pockets needed for fishing. I take it on longer trips. Have a smaller one for Uinta hikes. Con, I have to take the pack off to get what I need. Slings, I have two and probably mu favorite, but limited space, meaning can't haul water and a rain jacket takes up a lot of room in it, but a great alternative to a vest. Chest packs, nice. Puts everything right in front. But it gets in my way. Fanny packs. also great and a lot of them come with a place for a water bottle. Cons, it is hard on my hips and if I accidentally wade too deep, contents do get wet. I still use a vest but as you said, I haul only minimal. William Joseph or Orvis Slings are pretty nice. My preference is ditch all that pack/vest stuff. All I ever wear is a Columbia fishing shirt with large pockets. I only bring forceps, clipper, 2 sizes of tippet. Dry-shake, and small flybox. (I already know what flies I will need before I hit the water). Iphone for pics. All this fits in a shirt. This time of year I fish all the streams in boardshorts. I hate waders. If I'm far from the car Ill sometimes bring a camelback, but I prefer to hike back once in a while and have a cold beer instead. Check out the Patagonia or Orvis Sling you wont be disappointing its basically like fishing in a T-Shirt, Both have more than enough room to carry your gear, They packed allot of features into a small pack. Id would have been happy with either, Western Rivers had the Patagonia and there local so I went with the Patagonia. Chest packs are the worst... Sling pack or use a waist pack and just turn it around. I use both chest and vest. The vest mainly gets used on the toon. 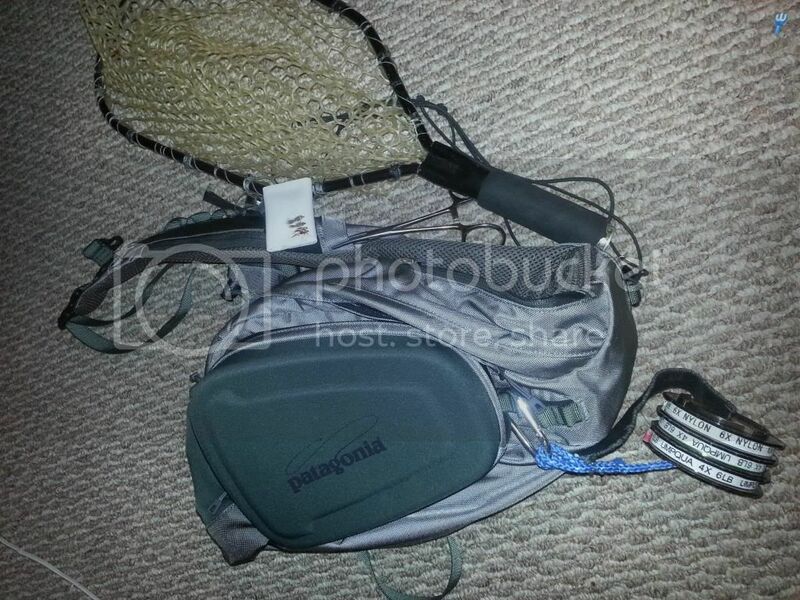 A couple years ago I found an awesome chest/pack pack at cabelas. It can be turned into a belt pack. Has a detachable pack for when I want to hike. Cons is the pocket area can't hold as much as a vest so I only use it for day hikes. I might see how it works on the toon though. I found my vest has been getting in the way while tooning. Never used a sling so can't comment on them. Here's some pics of the chest pack. Get a Sage DXL Typhoon Lumbar Pack. Its big enough to fit all your fly stuff and then some. It also has a big compartment that's waterproof in case you do a lot of deeper wading. Think of the Simms dry creek ones but bigger with more features and actually waterproof. They're a little pricey but worth every penny. Those are awesome,and the OP did say he wanted to lighten up. I've tried and got them all. Most of the time I use my Willy J Creel sling. It has 1100 cu-in of space and will hold 4 to 6 fly boxes, 2- 1 liter soft water bottles, wag bag, a few power bars and the ever present flask. It has straps to lash a rain shell on. And, it stays out the way when throwing a 2 hander!!! When combined with a lanyard and the batman utility belt, I'm set. If I need lot's of gear I prefer a Fish Pond Wildhorse pack/vest. It has 1350 cu-in of space.